Stay in the heart of Bergen. 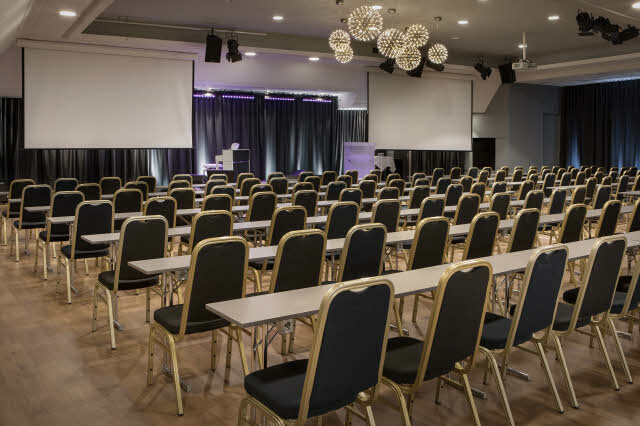 With ties to Bergen Kino, we have the city’s largest conference capacity for up to 2000 people. The hotel is perfect for anyone wishing to experience Bergen’s culture and attractions alongside meetings or a conference. With its central location, Scandic Bergen City is perfect for both business and pleasure. Bergen offers great cultural experiences and the theatre district is just a couple of streets away. You can visit Den Nationale Scene and Ole Bull Scene theatres and the Main Square Torgallmenningen. In approx 10-15 minutes walking distance, you will find the popular fish marked, Unesco listed Bryggen and the funicular to Fløyen. Nordnesparken park and a great choice of hiking trails on the 7 mountains surrounding Bergen. If you arrive to Scandic Bergen City by car, you can park in the parking garage P-huset Klostergarasjen, approx. 400 metres from our hotel. As the city’s leading congress organiser, we offer everything from the small and intimate to a hall for 700 participants.